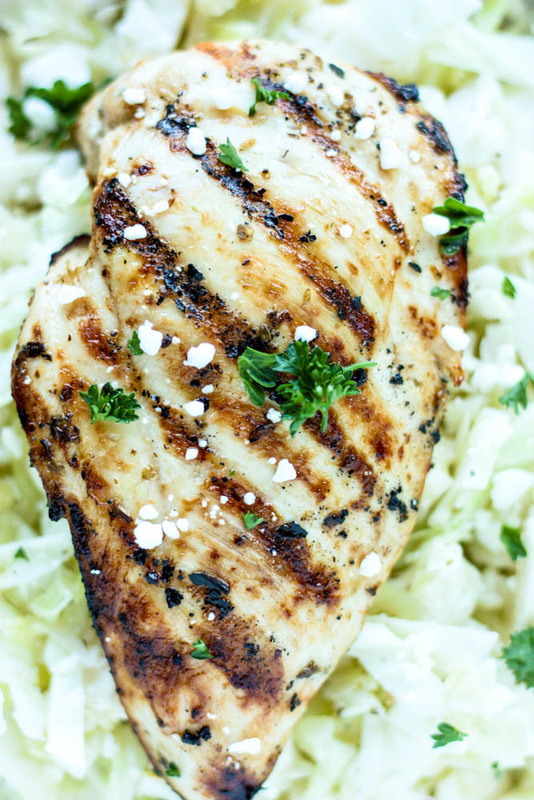 A protein packed, summer weeknight staple comes together quickly in this Grilled Greek Chicken Recipe. Enjoy! 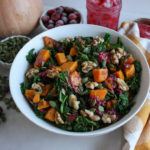 This recipe stems from a sort of “happy accident” that took place a few weeks ago. J and I were on the hunt for a wedding venue and were driving about an hour to look at the next place on our list. I’m really pretty directionally challenged, so as fate would have it, I thought the venue was located much closer to a Zoe’s Kitchen, which is one of my favorite places to go. Since J had never been before, I made a HUGE deal of going down for lunch before our appointment, and lo and behold, the Zoe’s was 45 minutes from where we actually needed to be. Epic fail. On the bright side – J absolutely loved the Greek Chicken Pita, which is stuffed with perfectly grilled chicken and cabbage slaw. So, I decided I was going to have to recreate some of their menu items at home, my own way. 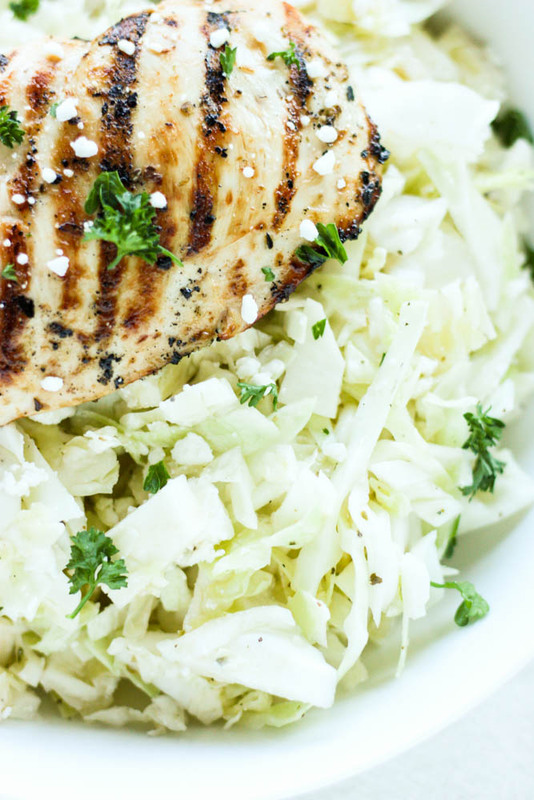 First up, is this Grilled Greek Chicken and Easy Cabbage Slaw. It’s light, tangy, and is the perfect meal for a hot summer night. I have been really into making slaws the past few months and I’m eager to share this variation with you today. 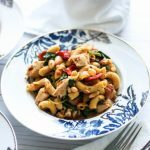 Italian seasoning – I use the organic version from Aldi – make sure to look out for funky preservatives! Let’s begin by making our Greek marinade for the chicken and slaw. Combine the lemon juice, red wine vinegar, Italian seasoning, garlic powder, salt, pepper, and olive oil in a mason jar and shake well. Remove your chicken from the fridge, rinse, pat dry, and trim the fat. Pound or cut the chicken into even pieces and place into a ziplock bag or a glass bowl with a lid. Pour half of the dressing over the chicken and allow it to marinate for 30 minutes – 2 hours. Never marinate chicken for more than 2 hours with citrus because it may start to break up the meat. 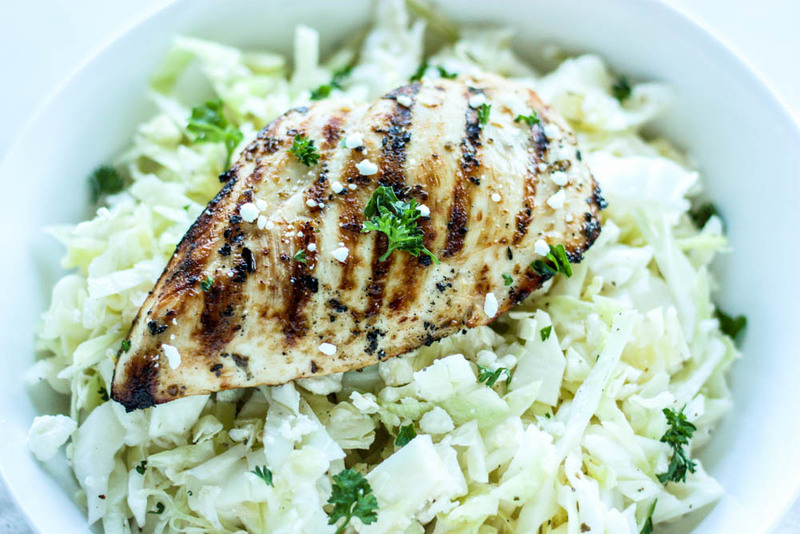 Right after the marinade is on the chicken, chop up your cabbage and place it into a bowl. Pour the remaining dressing over the cabbage and mix well. Allow this to sit for at least 15 minutes before serving, but I find that it tastes best after an hour or two. *Tip* – some cabbages (depending on age) absorb liquid differently. Taste your slaw before serving and feel free to add a splash (1 Tbsp. or so) of red wine vinegar if you feel that the slaw needs more acidity. It’s always better to be light handed and add more. When you go to preheat your grill to cook your chicken, place the chicken on the counter to come to room temp. It will cook more evenly. Preheat the grill to medium, and grill the chicken for about 5 – 8 minutes per side or until the chicken is no longer pink in the middle and juices run clear. 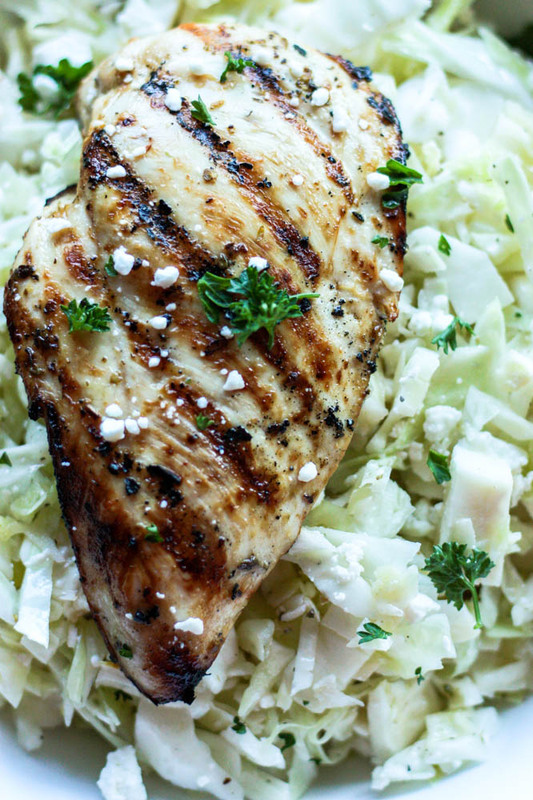 Serve the chicken atop the slaw and sprinkle with feta if desired. This keeps well for about 5 days! Remove your chicken from the fridge, rinse, pat dry, and trim the fat. Pound or cut the chicken into even pieces and place into a ziplock bag or a glass bowl with a lid. Pour half of the dressing over the chicken and allow it to marinate for 30 minutes – 2 hours. Never marinate chicken for more than 2 hours with citrus because it may start to break up the meat. Right after the marinade is on the chicken, chop up your cabbage and place it into a bowl. Pour the remaining dressing over the cabbage and mix well. Allow this to sit for at least 15 minutes before serving, but I find that it tastes best after an hour or two. *Tip* – some cabbages (depending on age) absorb liquid differently. Taste your slaw before serving and feel free to add a splash (1 Tbsp. or so) of red wine vinegar if you feel that the cabbage needs more acidity. It’s always better to be light handed and add more. 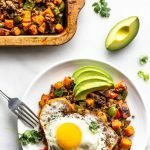 Cabbage slaw is SO good, and I love that you were inspired by a restaurant meal to create this meal. 🙂 Happy accidents are always a blessing. We just bought a grill so I’m looking for LOADS of recipes to try out! Can’t wait for this one.